The third paragraph is very hilarious but sad (God forgive me). I can only imagine what has become of okada transportation. I would argue that okada contributes to the economy in that, employees are able to beet the clogged up traffic and get to work on time. They also serve commuters, I think the main problem highlighted is the fact that they do not have training with regards to road traffic and health and safety, and they do not obtain registration. The government can easily introduce some regulation that would secure legalism and safe operation of okada, then okada can be acceptable but "okada economy"?...NO! Even though scrapping this mode of transportation may seem impossible. It is more than a wonder- the okada that is. I can't tell you how much my blood pressure goes up trying to avoid them weaving in and out of traffic; always trying to squeeze into the tightest of spaces. 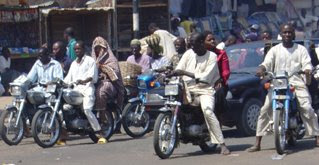 I agree it eases movement from A to B for a great majority, but a capital zero for health and safety awareness for themselves and others on the road.Someone once told me that most of the okada drivers are Malas - no experience required just get on the bike and go - no wonder!!!! I witnessed one drive straight into a roadside shrub/gutter through negligence. His female passenger slamed her head on the ground so forcefully that to this day I have moments when my thoughts wonder whether the girl will ever escape a long term head injury. Guess what...... he rescued his okada before even sparing time to attend to the girl. I have some interesting okada photos too..if interested. Believe me, they are not waiting for the traffic light, they are waiting for a motorist to slow down so they can move on! Still can't get over 'mario'. You climb on a bike and you become Luigi! i believe the okada is a necessary evil. as much as i hate to ride on them, when it gets to some roads, i'll rather pack my car and take an okada. but never on an express road or on the third mainland bridge or any bridge at all.training them will be the best. I want all the seven wonders, pleaseeeeee!